Ronald Koeman joked that Jurgen Klopp will be happy Georginio Wijnaldum sat out the Netherlands' draw with Belgium on Tuesday. Liverpool manager Klopp has taken aim at international football in the past few weeks, labelling the UEFA Nations League "senseless", insisting his players are playing too many games. "You have to call the manager of any country and say can you leave players out and he says I am under pressure as well," Klopp said last week. 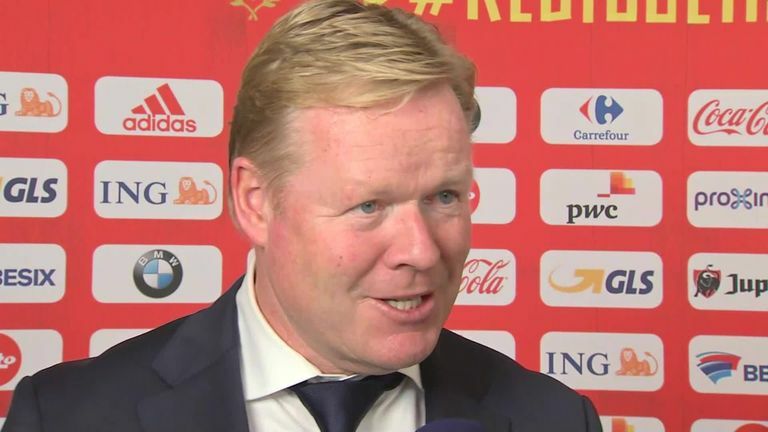 Koeman, after seeing his side earn a 1-1 draw in a friendly encounter with Belgium, was in good spirits when asked why Wijnaldum did not take to the pitch on Tuesday night in Brussels. "Maybe Mr Klopp is now very happy, and that's okay," Koeman said. "I hope I am back in the good books." Highlights of the international friendly between Belgium and the Netherlands. In Wijnaldum's absence, the Netherlands continued their improvement under Koeman with a well-earned draw against Belgium, with Arnaut Groeneveld cancelling out Dries Mertens' opener. "We know it is long way back, but we have seen a real improvement in the team. We started against Germany and got a really good win against a big opponent," Koeman added. "It is all about the final result. If you play France away, and don't have that final result then it is always difficult. One way [to improve] is to show what we can do and play good football, but the most important is to have a good result. "We beat Portugal, we lost 2-1 to France, we played Belgium 1-1 and we won against Germany and we got a draw away against Italy - these are not the easiest of matches. We are in a good way and I am really proud of the team."